Tip # 1: cranberries are cheapest around Thanksgiving - buy extra and freeze and then you'll always have some on hand. 1. Preheat oven to 350 F and prepare 12 - 15 muffin pans. 2. In a bowl combine flour, cinnamon, baking soda and baking power. 3. In another bowl beat butter and sugars with electric mixer until fluffy. Beat in ricotta cheese, egg, orange rind, orange juice and vanilla. Stir into flour mixture until just combined. Mixture will be stiff. 4. Fold in chopped cranberries. 6. Bake 20 - 25 minutes until a toothpick inserted near center comes out clean. Cool in pan for 5 minutes. Remove, cool slightly. Spoon on glaze if using. Sprinkle with chopped walnuts. Option: if not using orange glaze (see below) add chopped walnuts to the mixture at the same time as adding the cranberries. Combine 1 cup powered sugar/icing sugar with 1 tablespoon of orange juice and 1/2 teaspoon of vanilla. 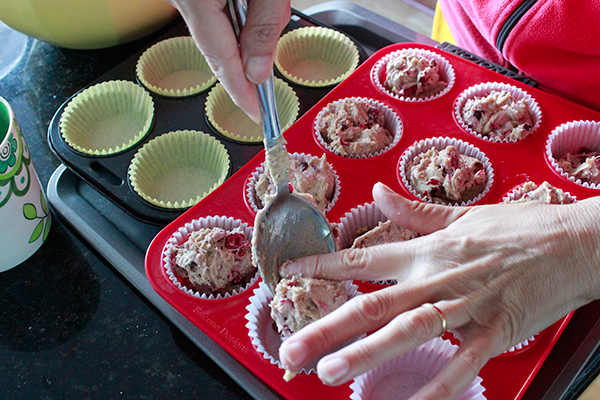 Spoon onto cakes and sprinkle with chopped walnuts. Tip # 2: chopping cranberries can be a challenge - they'll go rolling all over the kitchen. If you have a food processor it will do a great job chopping the cranberries. But use a light touch - pulsing until most are chopped. 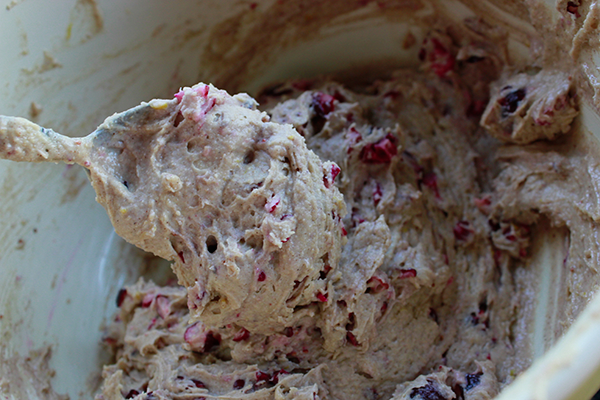 Chop cranberries first and then use food processor to cream butter and sugar. If you are using frozen berries wait until they have started to thaw a bit before chopping.